There is so many things I love about JBF!! Generally there are great price on everything for items for kids of all ages. 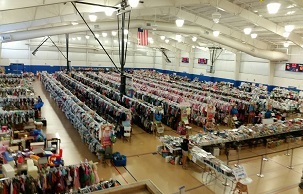 I've meet so many great people from volunteering my time at every sale. Breakdown is one of my favorite shifts to work. I live for recruiting others to volunteer breakdown so they can see what goes on behind the scenes to give then a better idea of what goes into doing a sale! We are all part of the JBF family now. Kate and Kelly are the best! They get the word out about sales in the area and are very organized! Getting Christmas and birthday(my kiddo has a January birthday) shopping done early for cheap is a win win! It's hard to not buy everything I touch!!! It's also fun watching my sales climb during the sale! Checks are efficiency sent out via email within 2 weeks of the close of the sale. Emailed checks is a great way to get our checks. It's fast and simple especially with my banking app.!! I always look forward to the next sale to sell our gently loved items.